What do US dollar banknotes look like? Currently printed denominations are $1, $2, $5, $10, $20, $50, and $100. The following table shows the current design of the notes both front and reverse. The currency is nicknamed the “green-back” as as you can see is predominantly green. So care should be taken when handing over money or checking your change in low-light situations. Post-2004 series banknotes have started to incorporate other colors to better distinguish different denominations. Which countries besides the USA use the US Dollar as official currency? 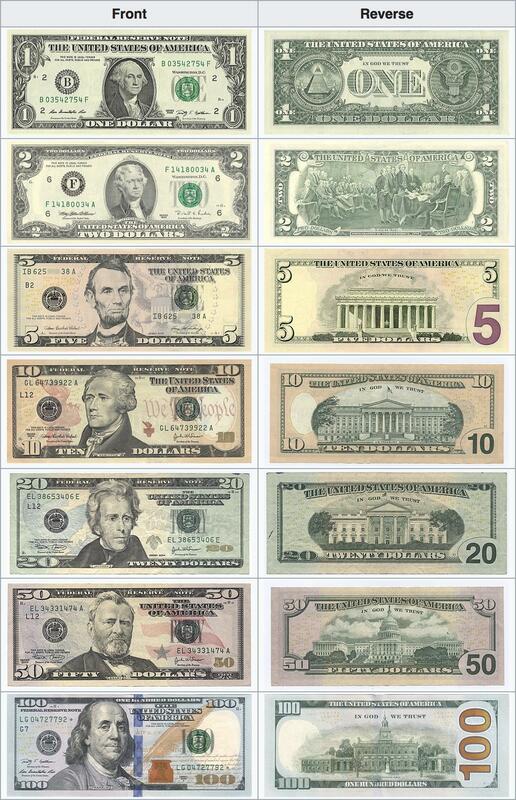 Other nations besides the United States use the U.S. dollar as their official currency. For instance, Ecuador, El Salvador, and East Timor all adopted the currency independently. The former members of the U.S.-administered Trust Territory of the Pacific Islands, which included Palau, the Federated States of Micronesia, and the Marshall Islands, chose not to issue their own currency after becoming independent, having all used the U.S. dollar since 1944. Two British dependencies also use the U.S. dollar: the British Virgin Islands and Turks and Caicos Islands. The islands Bonaire, Sint Eustatius and Saba, now collectively known as the Caribbean Netherlands, adopted the dollar on January 1, 2011, as a result of the dissolution of the Netherlands Antilles. The U.S. dollar is the official currency for governmental transactions in Zimbabwe.